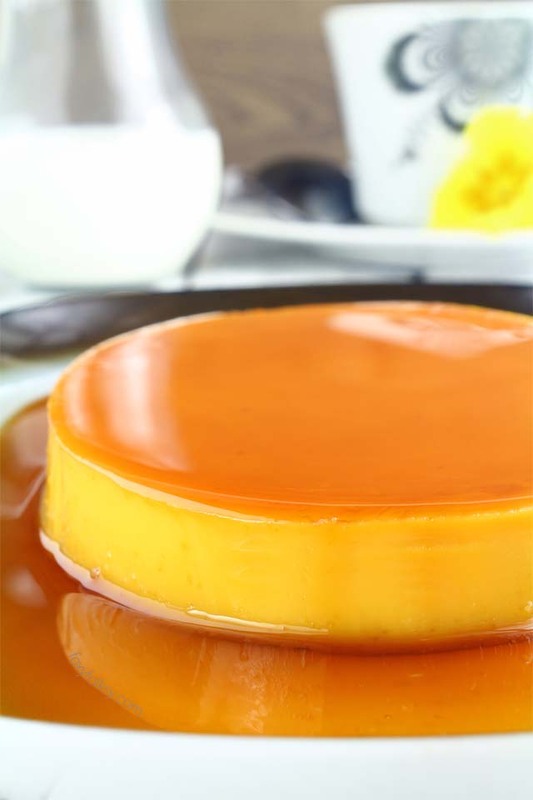 Leche Flan is a traditional Filipino dessert that is commonly served at Fiestas and other special occasions. It is caramel custard made of milk (‘Leche’ in Spanish), sugar and eggs and usually flavored with vanilla and key lime zest. Back then, we celebrated Fiestas (feast day of a town’s patron saint) every year in a really big way. We would prepare and cook food a day or two ahead and on the day itself, visitors from neighboring towns or even those from afar would come to our doorsteps all day long and sometimes it can last until late in the night. It is a fun occasion for giving thanks and sharing your blessings. Being the eldest daughter, I was taught early to help in the kitchen. This recipe of Leche Flan was the very first dessert I learned and was taught to me by my Lola (grandma) when I was only ten or so. The most important thing I remembered because she was very specific about it, is that I am not to make any bubbles while stirring the mixture to get that flawless texture. I also remembered how much my arms (yes both of them) and shoulders hurt from stirring real slow and for so long. Good thing I do not have to do this manually now and let my stand mixer do all the work and I have some trick up my sleeves. Well, it is not really so much of a trick, I only use a sieve or strainer to remove the stubborn pieces that take ages to melt. I hope my Lola, bless her soul, is not frowning at me when she sees me doing this. (Yikes!) But I am sure she would understand. I will also tell you a secret I learned to have a perfectly smooth-textured Leche Flan like this one. This Leche Flan was baked in the oven in a water bath instead of steamed. I got this neat trick from Lalaine’s Leche flan recipe of Kawaling Pinoy. I tried it on a batch I did for New Year’s Eve and it worked nicely! 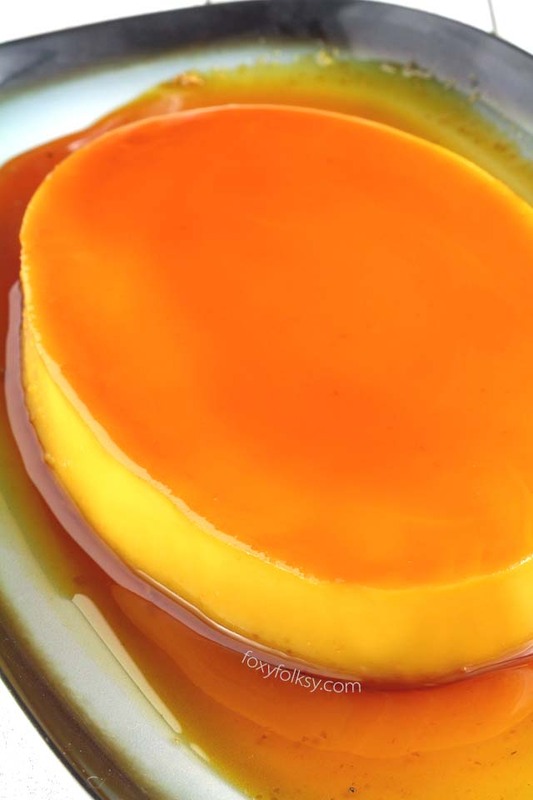 You may also be interested in trying my Puto Flan recipe. Combining two well-loved Filipino desserts in one, the Puto and Leche Flan. 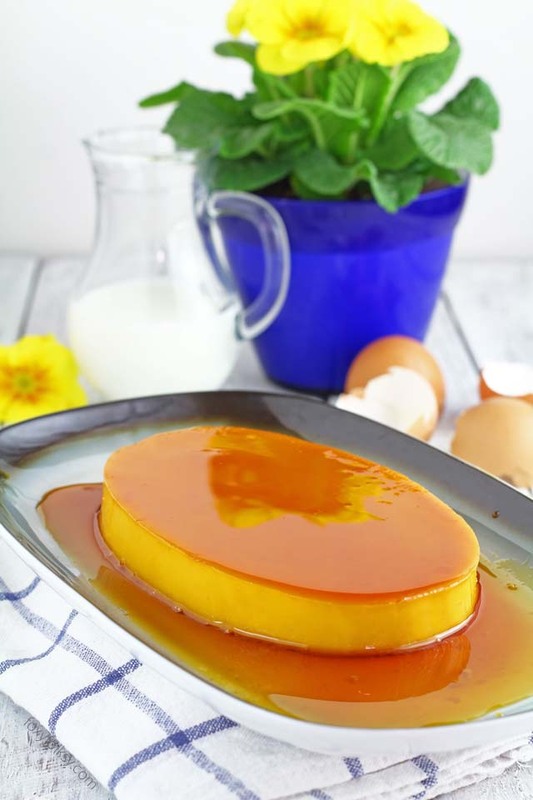 Learn the secret to a perfectly smooth and creamy Leche Flan! Get the recipe now for the ultimate dessert for any special events and occasions. Scoop 3 tablespoons of sugar in each llanera or flan molds. Place the llanera on top of the stove over low heat. When the sugar starts to liquefy, using tongs, turn the llanera in a circular motion to prevent the sugar from burning and let them caramelize evenly. Remove from heat once all granules have turned liquid and are light brown. Set aside. Place the egg yolks in a bowl, and slowly beat them with a fork. Try not to beat too fast and create bubbles. Slowly add the condensed and evaporated milk into the egg while continuously stirring. Lastly, add the vanilla extract and zest of key lime and stir a couple of times more until all is well blended. Sieve the mixture with a strainer to remove undissolved bits. Pour the egg-milk mixture into each mold. Tap the mold several times on a flat surface to get rid of trapped bubbles. Place the filled llanera or mold in a water bath and bake in the oven at 180°C/355°F for 25-30 minutes or until an inserted toothpick comes out clean. Let them cool down and then place in the fridge. Serve chilled. They may also be steamed like the traditional way but it might not be as smooth. If you do not have a llanera, you can also use a round aluminum mold. I tried this recipe tonight, and the custard itself is delicious. I had a little trouble with the Carmel/sugar mixture. When it cooled it got rock hard in the bottom of my ramekin. Some did not so covered my leche flan when I turned upside down. 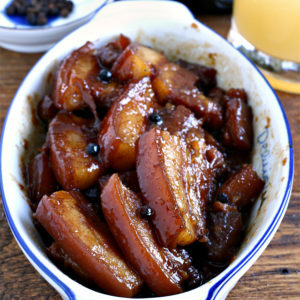 Is there a trick to the sugar when caramelizing? Maybe I cooked it too long. Hi Bobby, yes that is a common problem with the sugar caramel. It should harden when cooled but it normally melts again once you steam or cook the flan in bain-marie. When making the caramel, make sure that no lumps of sugar are left and it is completely melted. You can add more sugar to make more caramel so that you still have enough to cover the flan even if some does not melt again. I also find that if you chill it overnight in the fridge the caramel melts away and is easier to turn. Hi Caren, I am afraid the recipe calls for condensed milk specifically. If you will use evaporated milk in place of condensed milk, the outcome may be different. First, you have to adjust the quantity and then add sugar. Since I haven’t tried it I cannot say what measurements and if it will work at all. Hello Ms. Bebs, this is my favorite thing to cook. I was used to steaming it though. I would just like to ask if I was to bake it, do I need to preheat the oven or bake it right away? Do I still need to cover the llaneras?. Thank you. Hi Juliemar, no need to preheat the oven and you may cover the llanera with aluminum foil to make sure top is not burnt but I never found the need with my oven. Hi Riz, evaporated milk is thicker and richer than fresh milk but it should be fine, the texture would be a little lighter. Hello! It’s been FOREVER since I made Leche Flan and I’ve been looking for a recipe similar to my moms. 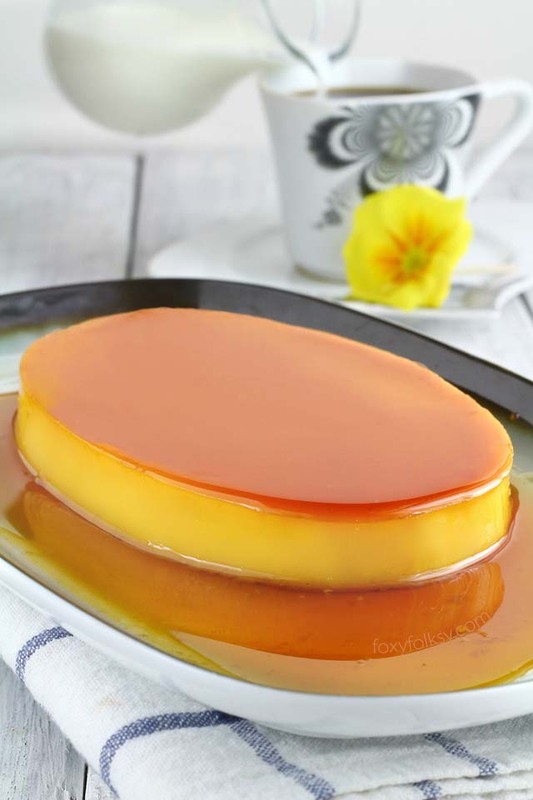 Do you know how long leche flan will keep in the fridge after it’s made? It’s only me and my husband, so I may just follow your instructions for one llanera but just in case I’d like to use the whole recipe, I’m curious! Thank you! 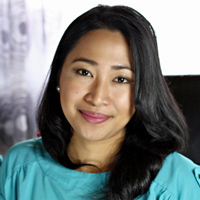 Hi Ann, I’ve never known a leche flan that has gone bad if they are in the fridge. Perhaps because of all the sugar that goes in it and the milk used is evaporated milk. Note however that the taste and texture may differ after a while. I would (and have) eaten weeks-old leche flan from the fridge and I still like them, lol. Personally, I like leche flan best when it has been in the fridge a day or two when it is still fresh but has time for the flavor from caramel and the custard to blend. Lastly. just remember to place them in a container with lid or cover the llanera with foil and seal with a string or rubber band so they won’t dry up. Hi there! I just tried your recipe last night and it was delicious!!! It’s been years since I baked a Leche Flan. Everything came out perfect except just wondering if what I can do to thin it out a bit? I like my Leche Flan not as thick texture. Any advice? Thanks again for your delicious post! Hi Jay, you can add more milk or reduce the yolks. I recently tried a flan with whole eggs and it was lighter in texture. Try using 6 whole eggs instead. Do not beat them, just mix gently. OMG! I just tried using 6 whole eggs like you said and to me it’s amazing!!! Just the right texture I was looking for. I was at first skeptical to use whole eggs but it came out super good! Thank you so much for the advice! You’re the best! Happy holidays! hi miss bebs, thank you so much for sahring your recipe and how you do it.. i’ve tried it too and it’s awesome.. i’m so happy with it..i’m looking forward to try your other recipes..
can i use microwave oven instead or turbo? At last!! This recipe is the one that ive been lookin for and so thankful, for this one is so easy yet really yummy! Thank u so much Ms. Bebs for sharing! 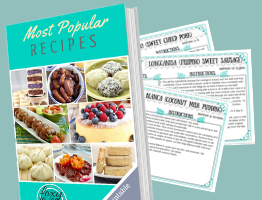 I am everyday excited to try your recipes?. Keep it up and God bless! I am glad that you are enjoying our recipes, Joyce! What size eggs do I need to use its egg yolk? Hhhmmm…never really thought about this one. The thing is, the size of the egg yolk, based on my experience, is not automatically proportionate to the size of the egg. I also just learned (because of this question) that younger hens lay eggs with smaller egg yolks. So I would say it does not really matter what size of eggs you use because you cannot be sure what size of yolks you will get. Use medium to large like I usually do. Hi! First of all, let me say that I’m super excited to try out this recipe and the sylvanas one. You make it sound so easy 🙂 I have a question though, how big is your llanera? I’m planning on buying some from Ebay and I’m not sure which one to get. I’m worried that it would affect my baking time a lot. thank you!! Hi Marcy, you can use medium to large size llanera, about 5.5 to 7 inches long and 3.5 to 4 inches wide. I would not worry much about the size though, any size and shape would do. You could try covering the top of each llanera with aluminum foil to prevent them from burning on top and just do the toothpick test to check if they are cooked through. Hi, can I use a mixer to mix all ingredients? or its better to just usemy hands. Thanks! Hi Kaye, you may use a mixer but only at low speed. A whisk is easier to clean though ?. Did tried it cooking in the oven and it did came out very smooth than steaming it as what I usually does..thanks for sharing! I always steam. Seems easier & smooth in d oven. Do I have to cover with foil? Hi Malavera, I did not cover it but you may if you want to. I am totally inlove with this one! I always steam my leche flan. I need to try this. Thanks, Bebs! Ilang minutes kapag sa electric steamer? Hi Gela, usually 30 minutes should be enough but you can also check if needs more time. Wow, this flan looks just perfect. I must taste heavenly! I’m gonna try it this next weekend, I bet everybody here will love it. Thank you for the recipe! Hi Wanda, thanks for dropping by and I hope you enjoy your flan! Happy weekends! previous post: How to achieve a crackle paint effect using glue!